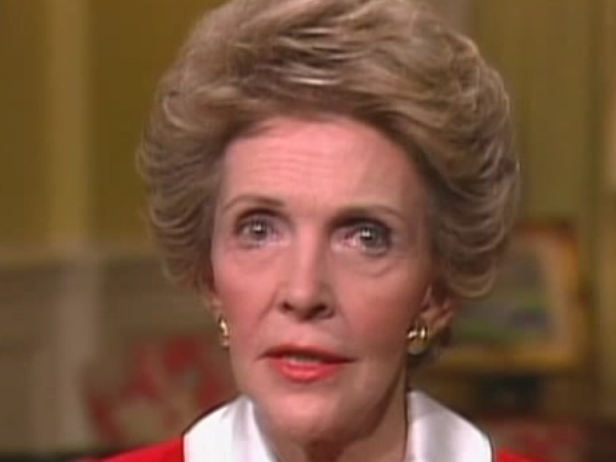 As public officials paid their respects to former first lady Nancy Reagan following her death on Sunday, many noted her prominent role in one of America's most high-profile anti-drug campaigns: "Just Say No." After popularizing the phrase during a stop at a high school in the early '80s, on September 14, 1986, the then-first lady and her husband took the campaign national. Speaking to the nation during a televised address from the West Wing of the White House, the Reagans announced a concerted public "Just Say No" campaign aimed at reducing drug abuse among teens. "Our job is never easy because drug criminals are ingenious," the first lady said. "They work everyday to plot a new and better way to steal our children's lives, just as they've done by developing this new drug, crack. For every door that we close, they open a new door to death." "Open your eyes to life: To see it in the vivid colors that God gave us as a precious gift to his children, to enjoy life to the fullest, and to make it count. Say yes to your life. And when it comes to drugs and alcohol just say no." Though the former first lady was a far more active player in influencing her husband's political decisions than many people realized at the time, the "Just Say No" campaign was the most defining aspect of her public time in the White House. The former first lady traveled the country as part of the effort, giving speeches, visiting schools, and working with groups like the Ad Council during the early '80s to develop messaging encouraging kids to reject the temptation of drugs. The campaign peaked in the late '80s, as millions of Americans joined organizations like the Just Say No Foundation, and advocates pointed to slightly lower drug use rates among high school students. But many critics asserted the former first lady's approach to drug prevention was unsuccessful, pointing out that it ignored the motivations for drug use and the long-term steps needed to curb abuse. Indeed, many social scientists found that abstinence drug education programs like "D.A.R.E." had little impact in reducing drug abuse among teenagers. Listen to a clip of the audio below, and read the full transcript here.